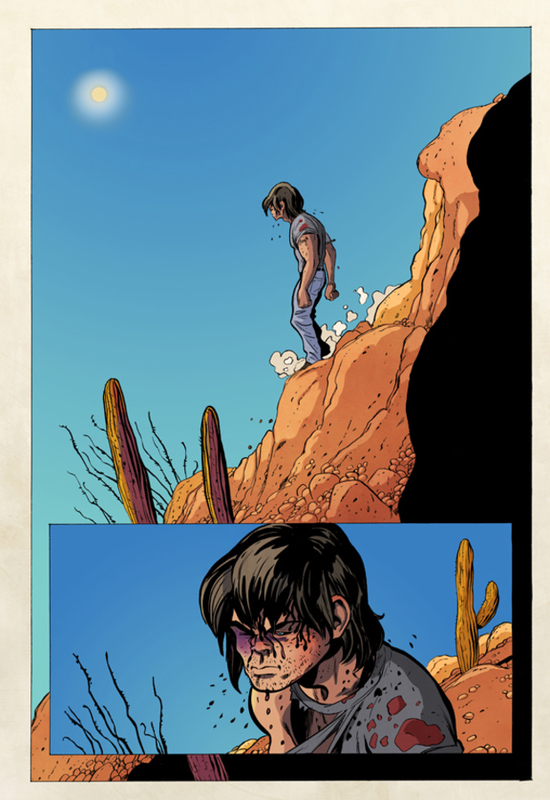 Under Jeff Smith's direction these colours provided by Steve Hamaker with Tom Gaadt are like little else in the business, with a completely different aesthetic to BONE's glossy gleam. For a start the paper stock is a lovely, thick matt while the colours themselves are soft and warm at night, yet clean and bright with wide, azure skies during the day out in the dessert. 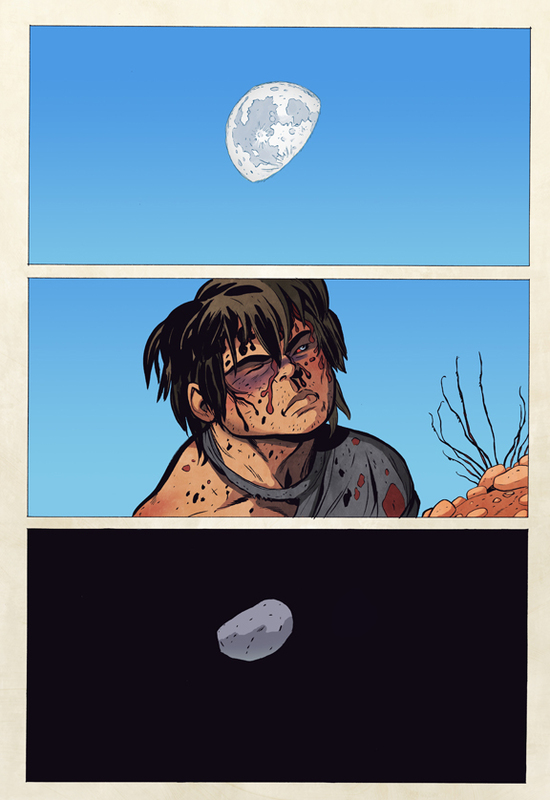 There is an extended sequence towards the end of volume 3 when our battered and blood-caked RASL, weighted and weary, lets himself surf slowly down the scree-slopes of the arid, clay-coloured outcrop exposed to a desiccating sun under the indifferent watch of a midday moon. There the blues and the sandy stones complement each other beautifully: heat and light and so much fresh air, even if it's too hot to handle. 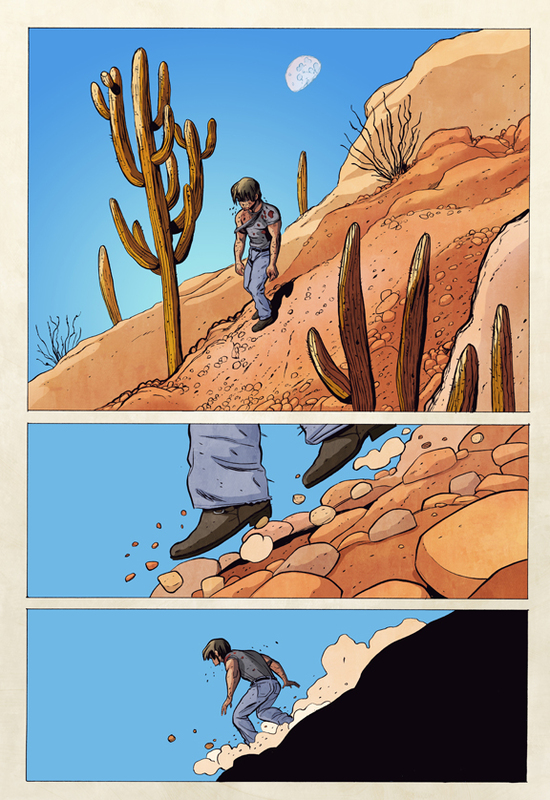 Jeff Smith even spent two weeks sweating bare-chested in the desert surrounded by cacti - something that's imprinted itself on the art here. There's a real physicality to the protagonist with slightly simian looks, his big mop of hair, his compacted, body-builder physique and the fountain of sweat that sprays off his face. Even the way he pulls up his slacks is sexually charged. You imagine he might have a growl like Tom Waits, and he sure likes his liquor bars and strip joints. 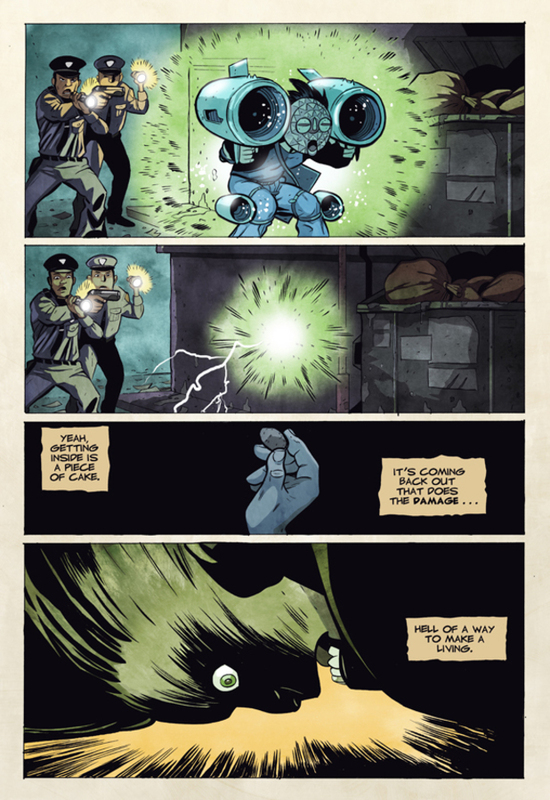 This is a brutally noir piece of extrapolated science set over several fictional worlds in which our art-thief hero stole the technology he's been using to hop between dimensions because it could have been used as an electromagnetic weapon. It involves parallel universes, conspiracy theory, Native American symbolism / spirituality and knowing your Bob Dylan. 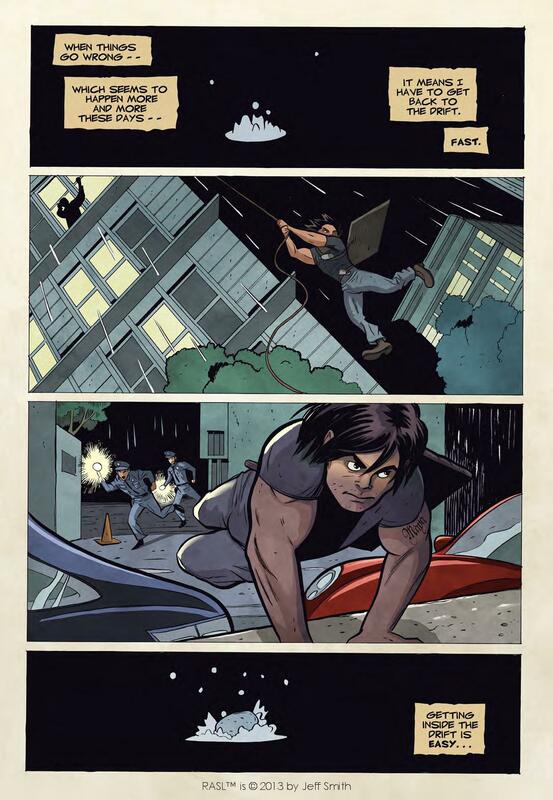 Well, it does for "RASL" Robert, which is why he knows he made the wrong turning at the trans-dimensional traffic lights. oh, you really do have to read this for yourself! It's eerie, unnerving, but utterly compelling, particularly the science itself. It is also, as you'd imagine, very, very beautiful with some extraordinary effects as the rooms start to ripple and morph. * For more on Tesla, please see CORPSE TALK: GROUND-BREAKING SCIENTISTS and GRAPHIC SCIENCE. 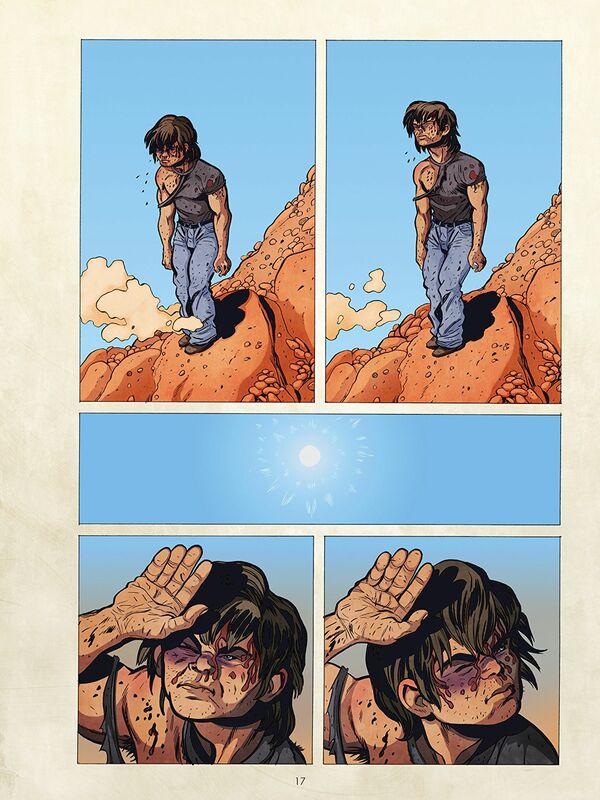 Please note: this review was originally written for the complete RASL h/c and our accompanying images may come from any of the three softcovers.